We have been so busy in therapy this week, that I have forgotten a few times that our break starts next week! I love when I have meaningful activities that let me have fun with a purpose! Because let’s face it, many of our kiddos do this for a few years, but I have a life long sentence to this speech/language therapy gig! So it has to be innovative and interesting for my own sanity! I have implemented the Bar Graph-a-Week into all of my groups. 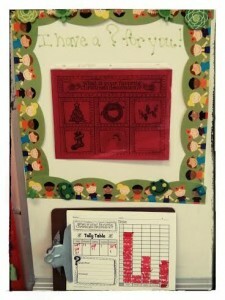 For the articulation and language groups that come to me, there is a question station right where we line up. I often use it as their ticket out. The questions are usually thematic and we can incorporate concepts (quantity, comparison) and questions (interests) into our conversation as we walk back to class. 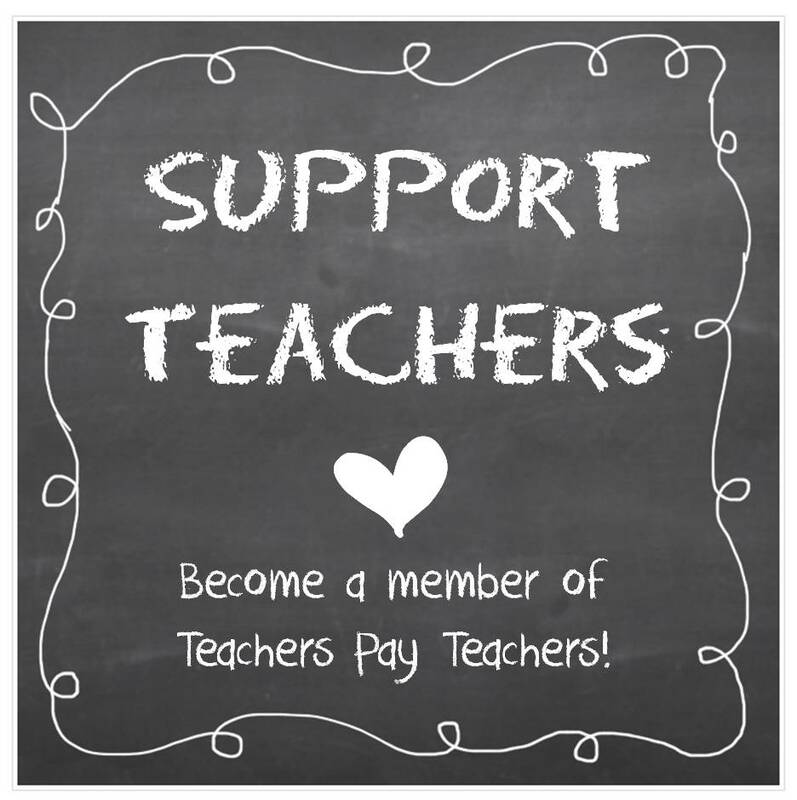 For the classrooms that I push into, I just grab the clipboard and visual cue. I was driving myself crazy having to remove and replace the magnets each time I took it with me (my hands are always full and this became tricky). Last week the genius idea struck me to glue magnetic strips to the back of the plastic sleeve (I use magnets from the back of notepads or business cards magnets). Now I just grab the sleeve and go and then slap it back on the board when I come back in. (Only took 3 1/2 months! Hey, you can’t rush genius!) Another little tip is that I print the choice board on color paper and place the entire month’s worth of graphs and cues on the clipboard. That way I’m only reaching into the filing cabinet once a month. I can’t say enough about how much I love this activity for relevant language exposure. 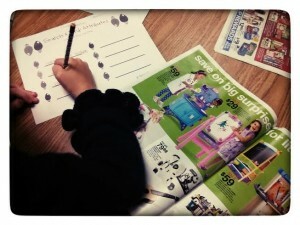 This week we started using the toy catalog companion from Jenna at Speech Room News. This is a great go-to activity that requires little preparation. My language groups started the week by searching for attributes. 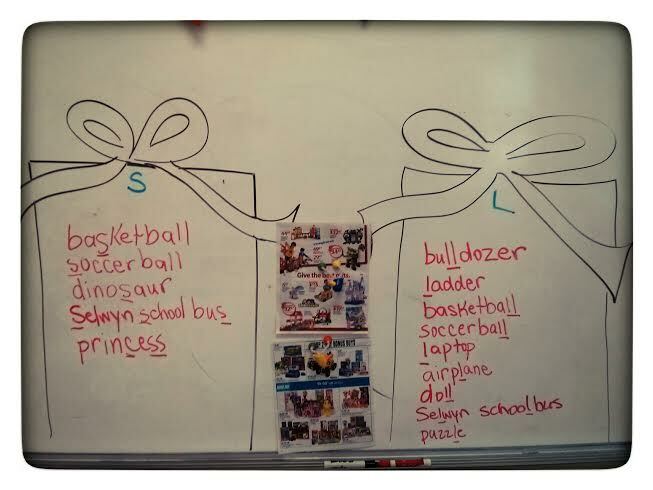 They picked out an attribute from the choices, numbered it, then wrote the corresponding toy on the list on the backside. (I had them number their spaces before we began searching) This way, when you look at the list and see #3 remote control helicopter, you know that they were searching for “something that flies”. My articulation kiddos get to join in the fun too! 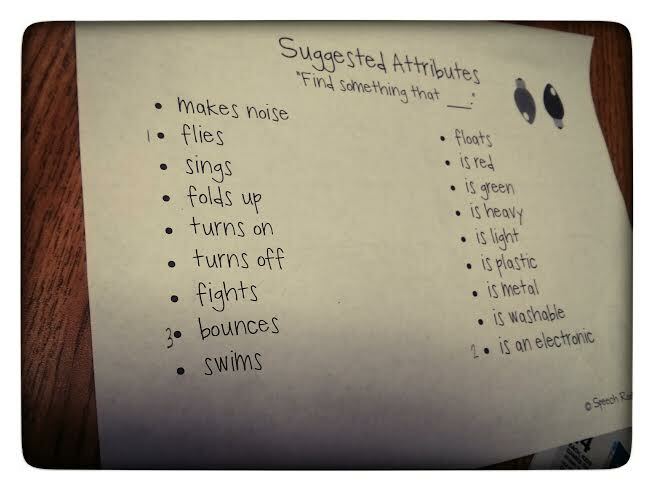 I used the template for the sound search with my 1st-3rd graders. However, with my kindergarten group today we worked it out on the board together. It was awesome! They brought their chairs over and we huddled up like a football team. 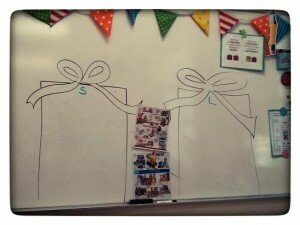 I had drawn two big presents on the board. This group is working on multiple sounds, but today we focused on /l/ and /s/. They each took a turn looking at the toy catalog and choosing a toy that matched one or both of the presents. They were having fun trying to find a toy (like soccer ball) that matched both sounds. Toys that we found to go in our /s/ and /l/ presents. 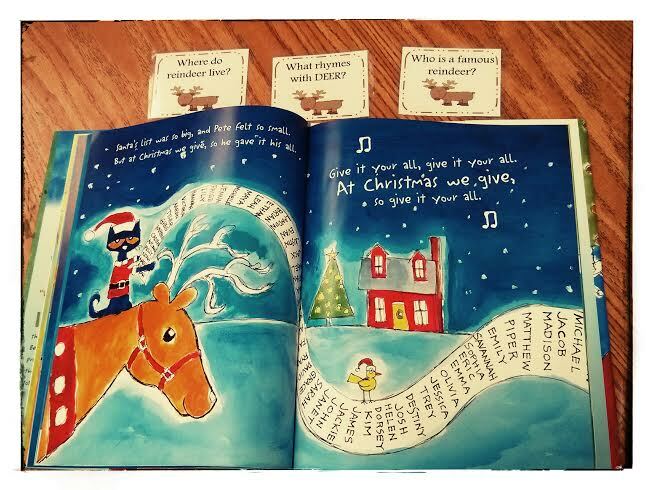 Several of my groups have been enjoying the book “Pete the Cat Saves Christmas”. We go over many concepts like hot, cold, up, down, long, and counting. I brought out some of the WH?s related to reindeer and we incorporated that skill in as well. Those questions are part of the set from “The Old Lady Who Swallowed a Bell”. I’ve also thoroughly enjoyed the “Christmas Around the World” set from Super Power Speech. It has a nice amount of text for my older articulation students as well as my students working on listening comprehension. 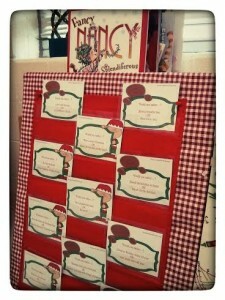 There are picture cues that go along with the traditions and food so students who need extra support have it available. 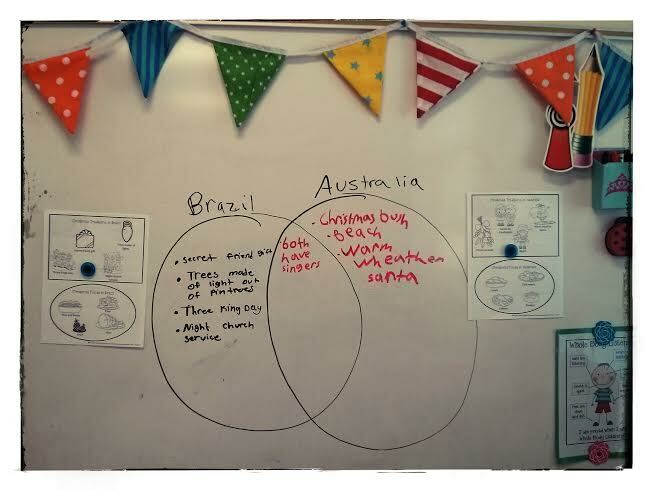 We spent two days learning about two different countries and writing info on the listening comprehension form. 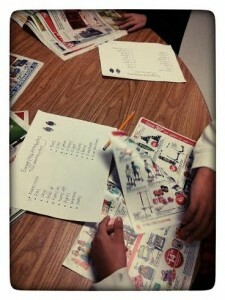 (I let each group choose which countries they wanted to learn more about). 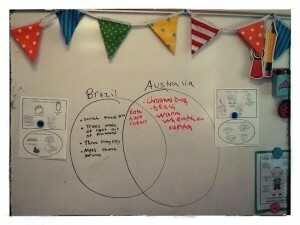 On the third day we created Venn diagrams on the board. They all needed the support of the text or pictures. This was a great way to apply content knowledge in order to compare/contrast. As we finish up the week, we will work on conversation skills, decision making, opinions, and questioning to answer these fun “Would You Rather: Christmas Style” questions. This is a great opportunity to get out and about to practice generalizing skills. 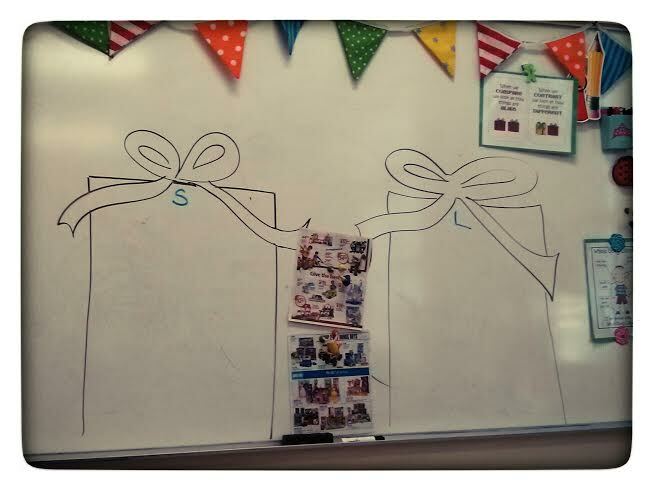 My articulation groups get to enjoy this also…they even have a sound sheet to write their target words as they practice. Believe it or not, this is just a snapshot of my therapy room this week. How are you spending your last week of therapy before the holidays? 2 Responses to A little of this and a lot of that!